Wednesday was a big day for Portland, as it was IKEA's grand opening. It's located in a new shopping development area near the airport, which means it's also very close to my house, only 15 minutes away! No more long drives to Seattle. I know some people are down on big box stores, but IKEA makes it so fun and happy and the quality of their merchandise has really improved since my just-out-of-college days. I headed over there tonight and was able to avoid any traffic by going a back way. I was also in and out of there in an hour, since I knew I didn't really need anything and was going more for the opening experience. The one thing I was eagerly anticipating was the fabric section, which they don't even have in Seattle. I wish I had brought a camera, but as you might expect there are lots of brights colors and patterns. You can see what's available here. I picked up several yards of this fabric from the Katrin collection. The fabric occupied a small corner with samples hanging from the ceiling and the bolts all piled and stacked at floor level. There were lightweight cottons and heavier home decorating canvas weight fabrics. Prices started at $3.99 and went up to $7.99 a yard. There was also a good selection of solids. I think I'll use the fabric to make a fall coat and maybe some pillowcases. I "SO" would love an IKEA here! THe only one near me is three hours away!!! OOo, yet another reason to love that we are moving to portland this year. 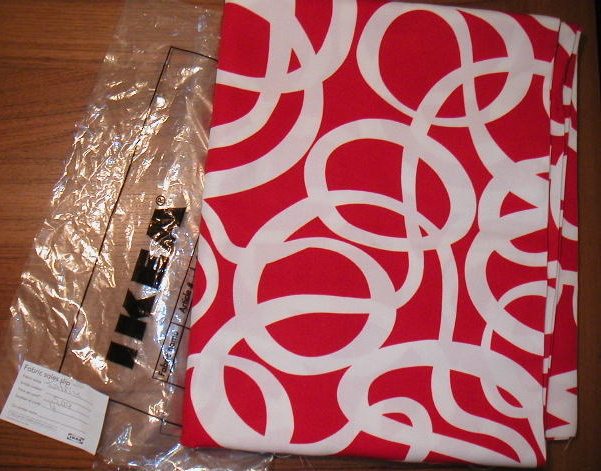 I love IKEA too, and their fabrics are so cool - I'm partial to the marimekko prints. Of course, with the purge happening, I'll be in a prime position to acquire more fabric when we move...dangerous!